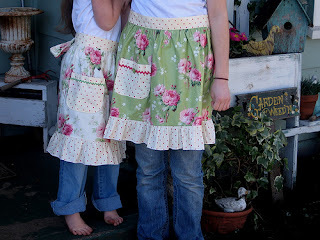 Heres a couple of the new aprons that I've been making. I've been sewing away preparing for a show we are doing in a couple weeks. It is a new show for us so we are not quite sure what to expect. The show is called Blackberry Junction, located west of Albany in an old grange. We are also working on a bunch of shabby little birdhouses. I'll be posting some pictures hopefully tomorrow. Marv is busy building some of his awesome cupboards from old windows. He does an incredible job that is even hard for avid antique rs to tell if the cupboards are of days gone by. 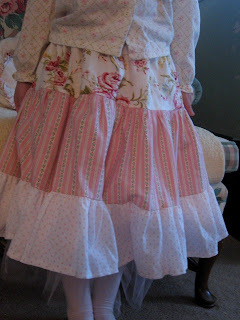 I have been on an apron kick and will also take some pictures of some of my new ones. 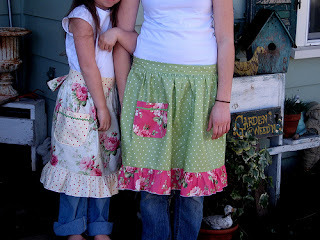 In the mean time, I designed another little skirt for my youngest daughter. She is so easy to please! Yesterday I worked on flea market bags, here are the results. A vintage button was added for a little bit of "bling", I have several more made up and will now be working on vintage aprons. I have stacks and stacks of fabric waiting to be used. I am very excited to have finally gotten a serger after many years of thinking myself unteachable . I have sewn for years with my very simple sewing machine and put many miles on it. My husband convinced me that he would learn also so he could help me when I get myself into a tangle. I absolutely love it! I am zooming along at a much faster speed which suits my attention span much better. This is my first project with the new serger. Luckily my youngest little gal Sarah is very impressed and encouraging me to "do more". 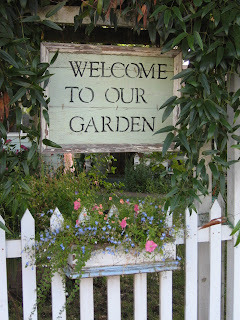 I love flowers and gardening so I like to put things that make make me smile throughout our yard. 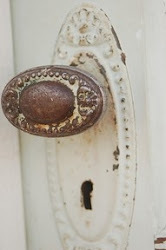 Our home business includes a lot of different types of cottage decor. Some is for indoors, and the majority is made for outdoor use. We build garden cottages from recycled materials, a large variety of birdhouses from recycled materials, benches, potting tables, and many other garden items both for decor and function. This is our first attempt at blogging, with help from my son Aaron we will hopefully master this. 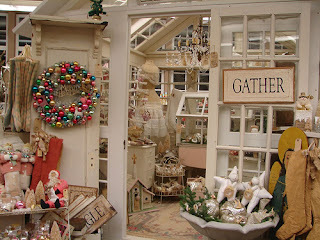 This is a picture of one of our cottages set up at an antique show at the Monticello Antique store in Portland Or. We will once again this year be one of their featured guests at the Spring Sale in April. At the moment I'm sewing away at my new serger. 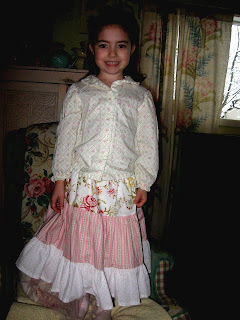 When I'm not with my children, you will probably find me out in my sewing cottage surrounded by stacks of vintage fabric.